Whether for work or play, our hands cradle a computer mouse every day. Unbeknownst to many, the modern mouse is basically a camera that captures thousands of images of the surface underneath. A powerful miniature sensor is responsible for tracking the mouse’s coordinates thousands of times per second. PC games rely on mouse movements and its sensor defines its accuracy and the ability to track smoothly. So professional eSports players and enthusiasts, who consider the gaming mouse as their weapon. The sport is set to be a US$1 billion business with a global audience that is over 300 million-strong, according to the World Economic Forum. And a small, little-known Malaysian company, PixArt Imaging (Penang) Sdn Bhd, a market leader in sensors for high-end optical and gaming mouses, is poised to take the best advantage of it. The integrated chips (IC) design firm has its origins in the state’s high-tech manufacturing area, the Bayan Lepas Free Industrial Zone, where hundreds of multinational corporations set up factories for manufacturing and research and development. About six years ago, Taiwanese complementary metal-oxide semiconductor (CMOS) imaging sensing and navigation company PixArt Imaging Inc acquired the division of Avago Technologies Malaysia, which was previously known as Agilent Technologies, an American company established as a spin-off of Hewlett-Packard (HP). “In early 2000, Agilent embarked on a strategy to have its teams in the US focus on what it calls the more exciting, new, high-growth areas — also known as the ‘win big’ strategy. This resulted in the transfer of businesses and R&D ownership for some of the more mature products to lower-cost countries like Malaysia. “We benefited from that strategy. The original optical mouse sensor was invented by HP Labs (HP Inc’s exploratory and advanced research group) in the US. In 2000, HP-Agilent launched the optical mouse sensor and started to convert the ball mouse into optical mouses,” recalls Pan Kok Chin, vice-president of PixArt Imaging Penang. Despite being considered a mature business and technology, Pan says there were segments within the optical mouse sector that became exciting, such as the gaming mouse segment, which has been driven by the popularity of eSports. Gradually, the company started to shift its focus from the office mouse to the high-end gaming mouse market. It made sense, as there were more competitors offering similar products, causing PixArt’s profit margins to erode. 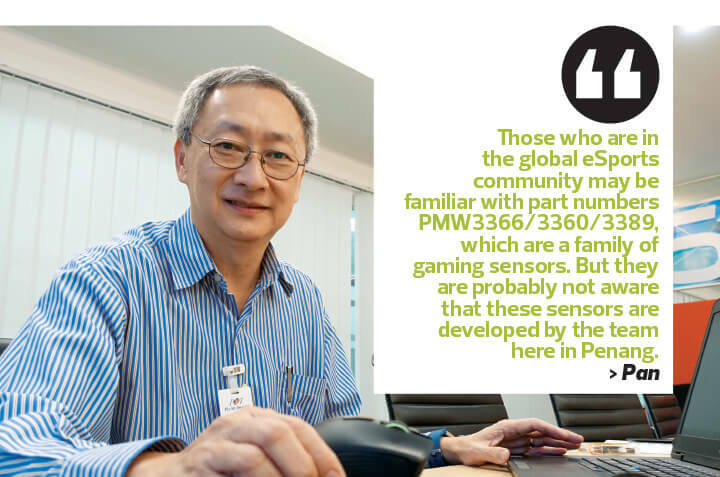 “Through the support and funding of PixArt Imaging’s headquarters, and working with our customers like Razer and Logitech, PixArt Imaging Penang has become a leader in gaming sensors. Those who are in the global eSports community may be familiar with part numbers PMW3366/3360/3389, which are a family of gaming sensors. 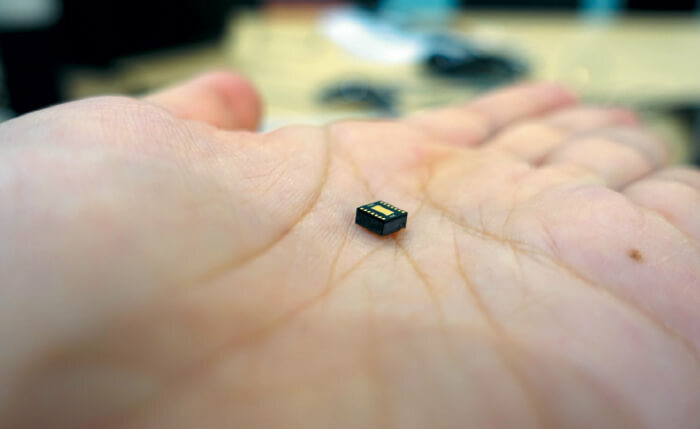 But they are probably not aware that these sensors are developed by the team here in Penang,” Pan tells Enterprise in an interview in his office, situated in the aptly-named Eureka Complex, Universiti Sains Malaysia. It takes about six months to make slight changes to a sensor and about a year or longer to develop a new one. Pan says gaming mouse makers are always looking for sensors with improved performance as they look to edge out the competition and ensure that their customers get the best gaming experience. “At PixArt Imaging Penang, we focus on areas and applications that we do well and that very few others can do, such as gaming sensors as well as track-on-glass and sensors that consume less power. “We are one of the two major suppliers [of gaming sensors] in the world. In fact, in terms of high-performance sensors, I would say we have the leading market share. This has allowed us to achieve healthy margins for our products,” he says. As a wholly-owned subsidiary, PixArt Imaging Penang receives funding from its Taiwanese parent company. Over the next three years, Pan says PixArt HQ will invest over RM90 million in PixArt Imaging Penang for R&D. “Competitive government tax incentives are important for MNCs like PixArt Imaging Inc, as they can attract tax incentives for similar R&D if they were to locate in other countries. So it is important for our government to remain competitive.” he says. When Avago Technologies was acquired by PixArt Imaging Inc, there was a period of uncertainty, says Pan. With the support of its chairman Huang Sen-Huang and the team at headquarters, however, he says the team was able to retain almost all its members through that transition. Since then, it has grown and beefed up its talent, capabilities and even its portfolio of products. “[For the acquisition], we basically made offers to the entire R&D and marketing teams and 95% of us decided to move from Avago Technologies to PixArt,” he says. PixArt Imaging Penang’s in-house R&D competency includes IC design, system development, optics and mechanical design and testing, as well as product and application engineering, which are all the elements needed to conceive, design and bring a sensor product into mass production. “Our intellectual property (IP) and expertise are our key differentiating points. We do what others cannot replicate so easily. Our parent company in Taiwan provides us with the corporate support, funding, some of the IP and the critical link to the wafer fabrication plants in Taiwan,” he says. Right now, the company has 80 employees, most of whom are R&D engineers. And what’s more, all of its talent is local, which, given the dearth of such talent in the country, is quite a feat. “We need more people who can do this level of R&D to develop best-in-the-world products. In a competitive world, we always need to keep improving our products. “But competition is a very good motivator for the organisation, especially with our talented and passionate engineers. If a competitor comes out with something we haven’t seen before, we are motivated to improve on it further. Sometimes, competitive pressure brings out the best in our people,” he says. Hiring the best talent and retaining them is challenging, and the organisation has to be competitive versus other major MNCs and local companies in terms of providing adequate compensation as well as creating the perfect work environment. “I think we are in a unique position as one of the few companies in Malaysia that does this level of leading edge R&D. And as the proverb goes, ‘as iron sharpens iron, so one man sharpens another’. “I think good engineers like to work with other good engineers,” he says. In this way, the company has managed to bring together an excellent core team of engineers. With an overarching mission to continue to innovate and develop new gaming mouse sensors to meet market needs, PixArt Imaging Penang also aspires to maintain its market leadership position. At the same time, Pan says it is expanding its technology in imaging sensors and optical flow to new applications, such as drones and robot navigation. PixArt’s gaming sensors have been generating interest in non-mouse applications. Pan points out that other customers are aware that its sensors are like ultra-high-speed cameras that take over 15,000 pictures per second with integrated algorithms to track high-speed motion. Another PixArt sensor application can be found in an input device for Microsoft Surface (touchscreen Windows personal computers). The accessory, known as Dial, is designed to be placed on the screen to produce radial menus and act as another form of input. “Some customisations and finetuning are needed to implement the sensors for other applications. For drones, PixArt sensors enable them to hover statically,” says Pan. “They are also used in robot vacuum cleaners as specific sensors are good for certain surfaces such as carpets or wood.